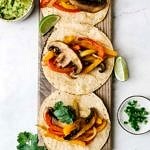 This vegan fajita taco recipe is perfect when you need a quick and easy weeknight meal! In a large skillet, heat oil or water over medium heat, add the onions, peppers, cumin, smoked paprika, garlic powder and salt, toss to combine. Add in the mushrooms and saute, gently stirring the mushrooms carefully, until peppers and portobellos are soft, about 10 – 15 minutes. Smash or slice the avocado. I smashed mine and added the juice of 1 lime and about 2 tablespoons of diced jalapeno and generous pinch of salt. Layer each tortilla with the mushroom-pepper mix, top with avocado and cilantro. Add a squeeze of lime over top. A little hot sauce would be great too! To round out the nutritional profile, add a can of black beans (drained and rinsed), for more protein, in the last 5 minutes of cooking. Nutritional information is calculated using corn tortillas.